I love Thanksgiving. I love that we have a day dedicated to giving thanks for our lives and what we have. I love that I get a break from school so I can come home. And, I’ll freely admit it, I like the food. There are a lot of my favorite foods that I only get a chance to eat at Thanksgiving (mainly cranberry sauce and mincemeat pie). Most of all, I love what Thanksgiving means and that it provides us with an opportunity to reorient our hearts to praise God for all that He has given us. What I do not like is this day: Black Friday. The day when all around the nation stores are trying to make us forget all that yesterday means and teaches. The day when human greed and all ugliness come to the surface and are accepted, celebrated even. And we all so quickly forget what we say around the table. It saddens me that in mere hours we go from marveling that to count our blessings is to number the stars, to this mindset that our lives are incomplete unless we buy more stuff. And yes, said stuff is on sale. Yes, Christmas is coming and it’s time to buy presents. Yes, buying things on sale can make it possible to give more generously to those we love. And I’m not condemning everyone who participates. But I am crying out against the spirit behind “Black Friday.” Why, I ask, do we have to have so much stuff right now, on this day? Why do we have to make it this Hunger Games-esch competition where so many people treat each other as nothing more than obstacles between them and their goal? Why do we all forget so quickly the purpose of the day so close behind us? What does it say about our society that we spend more time in this week seeking to increase our earthly treasures rather than giving thanks for what we already have? And, for the vast majority of people who participate in Black Friday, what we have is a lot. And so, on this day. Black Friday. While thousands of people are racing around buying everything in sight even as I type this post…on this day I give thanks. On this day I thank God for all that He has given me, and I recognize that it is so much more than I need. I praise Him for being so generous that He would grant us this beautiful world and all the blessings that come with it. I thank Him that I am home, that I am with my family in this little valley so far from the chaos of Denver. I thank God that He continues to work in and through me even when I so often fall short. And I do fall short…I fall short in the very area I am currently ranting against. I do have too much stuff, and all too often I forget my overabundance in my desire for more. But the day we just finished is the example of what I should be like, what we should all be like, and I want to hold on to that for as long as I can. I want to use this time to remind myself of how we should be, and in the midst of praising God I want to ask Him to help us become that. Because we should be people who live with grateful hearts, living in joy for all that we have and even what we don’t have. We should be people for whom Thanksgiving is merely an opportunity to gather and feast because we live in such a constant state of thanksgiving it’s impossible to express it any further. Every moment of every day we should be crying out with the Psalmist “Praise the Lord! Oh, give thanks to the Lord, for He is good! For His mercy endures forever” (Ps 106:1). And yes, we’re all far from succeeding, but why should that stop us from trying and asking God for the strength to keep trying? And maybe the first step toward being thankful in all ways is to hold on to the focus of Thanksgiving even when everything is on sale. Maybe the first step is letting that one person push ahead of you, recognizing that they are a human being with their own life and story and you don’t truly need that one thing anyway. Maybe the first step is going without those few new things in order to understand the value of what’s already in your home…the value of family and laughter and time spent talking and playing and even just sitting next to each other. 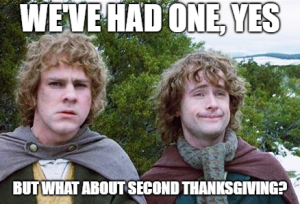 Maybe instead of Black Friday we should have Thanksgiving #2.